A VW Beetle with big ideas about itself. 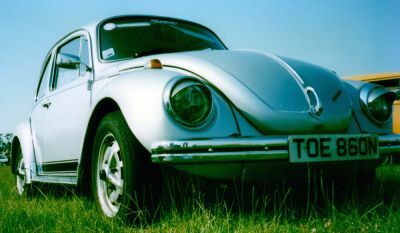 That's why we've called it, quite simply, the Big Beetle. There's a 1600 power unit which will take you from 0 to 50 in just 13 seconds and after that you can cruise all day at around 81 mph. This Big Beetle is really something rather special, in fact it's special effects certainly make quite a list. 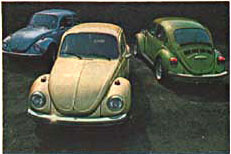 There's wall to wall carpeting, wide ribbed corduroy seats and a range of Big Beetle metallic paint finishes. To continue. There's a sports gear shift, a wood-look facia and a sports steering wheel that's a real pleasure to get to grips with. There's still more however, very sensible rubber faced bumpers and a pair of powerful reversing lights. All in all the Big Beetle will take some missing, it's big extras are more than noticeable. But just to make certain it's recognised for what it is there are some special side stripes to make the point. That point being at course, "The Big Beetle". Try one for size, feel its quality. We know you'll love its big difference. It's also something we haven't yet mentioned. A Big Bargain. Features: '1303 Big' side stripe (UK Plain Black). 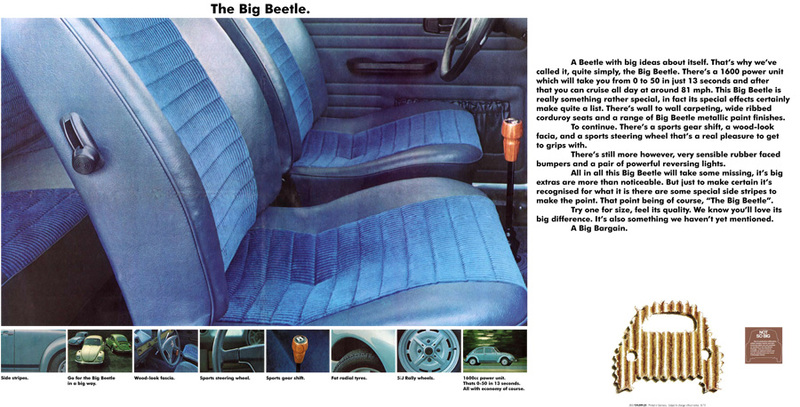 Corduroy upholstery (Nut Brown, Bamboo, Marina), colour matching loop pile carpet, inertia reel seatbelts, wood veneer dashboard, vinyl padded steering wheel, wooden gearstick knob, 5.5Jx15 sports wheels (1974 Model 4.5Jx15), M option Z05*, optional head restraints, sunroof and headlamp washers M288.